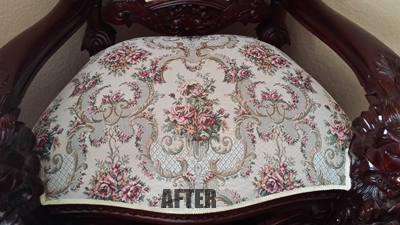 Here are some before and after pictures taken during a recent upholstery cleaning in Tampa FL. Even though the customer did not know the origin of the stains Chem-Dry of Tampa FL was able to remove them and bring this chair back to it's original color. If you have stained antique furniture don't be afraid to get it cleaned. 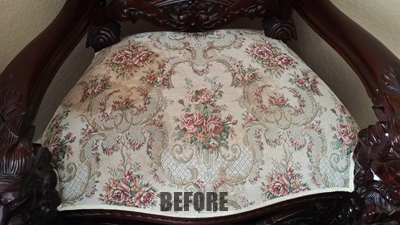 Just make sure you call a professional upholstery cleaner who can work with aged, or delicate fabrics. It's important to use a professional who takes the time to ask the right questions and survey your furniture properly before cleaning. You can always count on a quailty professional cleaning with Chem-Dry of Tampa. Call Chem-Dry of Tampa FL for all your Upholstery cleaning needs.